Vaccines. Popular sports drinks. Computers. Each one of these subjects is different from the others. But all three have something in common: they were all invented by researchers working at a college or university. Scientific invention and cultural exploration have been connected with higher education institutions for hundreds of years. Victoria McGovern says this is because colleges and universities would be limiting themselves if they only taught existing knowledge. McGovern is a senior program officer with the Burroughs Wellcome Fund, an organization that supports medical research in the United States and Canada. McGovern argues that the search for new knowledge is what leads to greater discoveries and better education. Dr. William Hahn, who is working on malaria research, walks through a research lab at the University of Washington's UW Medicine South Lake Union Campus. But she notes that research costs money and most colleges and universities do not have a lot of extra money for that purpose. Most schools have limited budgets and many competing goals and needs. So a big part of being a researcher at a college or university is asking for financial support from other places, McGovern says. Such places include private companies and organizations like hers, as well as local and national governments. The National Institutes of Health, or NIH, is one example. The NIH is the main government agency in the U.S. that supports medical and public health research. The NIH provides about $32 billion a year for health research. Researchers must apply for this financial support by writing a grant proposal explaining the goals and processes involved in their work. McGovern says the application process for grant money is highly competitive. It can be very difficult for some researchers, especially those who are not skilled at expressing themselves in writing. Kristine Kulage argues that it is now more difficult than ever for university researchers to get funding. Kulage is the director of research and scholarly development at the Columbia University School of Nursing in New York City. She has been working in university research for 20 years. She says that the grant application process has only gotten longer and more complex. 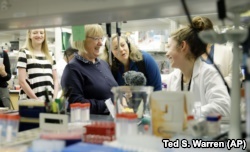 U.S. Sen. Patty Murray visits with lab technician Kennidy Takehara in a research lab at the University of Washington's UW Medicine South Lake Union Campus. She said in addition to all those responsibilities, researchers must make sure they are compliant with regulations. “There are so many rules now…It takes individuals who are now trained as research administrators to know what those rules are…And know whether or not the rules are being followed,” she said. Kulage suggests that schools now must do more to support their researchers if they want to successfully earn grant money. Last November, she published a study of what happened when Columbia’s School of Nursing chose to better support its researchers. The report studied how, between 2012 and 2016, the school chose to invest $127,000 in the creation of a support system. This system includes employing administrators to complete necessary application documents, freeing researchers to spend more time on their research. The system also provides a review process in which researchers go through several steps before they submit a grant proposal. First, researchers must write a short, clear description of the aims of their project. 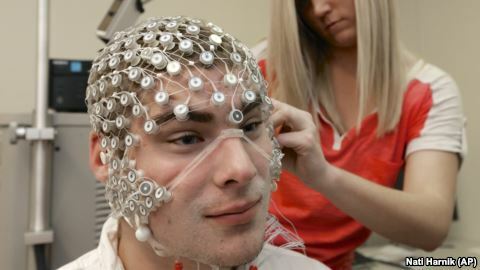 Researchers often have difficulty explaining their work to people with no special knowledge of the subject matter, Kulage said. So, Columbia administrators with no involvement in the research read the description and offer criticism. Other researchers also review the description to offer their ideas about whether or not the goals of the research can be reached. Finally, after changes are made to the proposal, administrators and other researchers meet with the grant writers. They then hold a review meeting similar to what the grant-writers will face once they have submitted their proposal. 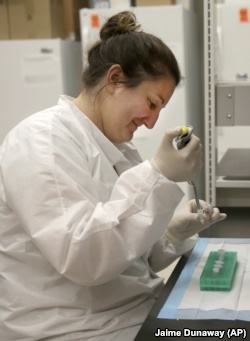 Ph.D. candidate Nicole Novroski works with DNA at the Center for Human Identification research and development lab at the University of North Texas. Normally, the group offering the grant will meet with the proposal writers and ask them questions. They expect the writers to defend their proposal. In this practice meeting, the grant writers get a chance to think about their project more and better prepare their defense of it. Kulage says the efforts of Columbia’s Schools of Nursing had clear results. Over the five years studied, the proposals that went through the review process were about twice as likely to be accepted as those that did not. The Columbia School of Nursing’s investment of $127,000 led to $3 million in grant funding. McGovern and Kulage both agree that applying for research funding alone is very difficult. So, even having one other person read a proposal and give their opinions can be very important to its success. Kulage admits that large companies carry out a lot of research and development. But their research usually relates to success in their industry. University researchers are different. They have the freedom to take risks on possibly unpopular ideas. Those risks can often lead to important discoveries that colleges and universities have a responsibility to share with the world, she says. I’m Pete Musto. And I’m Susan Shand. Pete Musto reported this for VOA Learning English. Mario Ritter was the editor. We want to hear from you. In what ways do universities in your country support their own researchers? How complex is applying for a research grant? Write to us in the Comments Section or on our Facebook page.